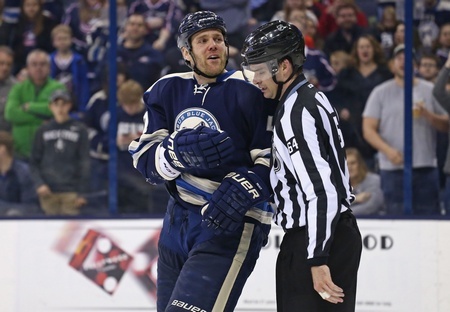 The Columbus Blue Jackets have signed defenceman Dalton Prout to a two-year contract extension, with an average annual value of $1.575 million. Prout will be paid $1.25 million in 2016-2017 and $1.9 million in 2017-2018. This is a decent raise from his current $1.075 million deal. The 26-year-old from Kingsville is a big and bruising blueliner with a knack for playing a physical game. He has eight points in 56 games, including two goals. He’s also put up 87 penalty minutes. In 201 career games, Prout has five goals and 29 points with 234 penalty minutes. He was drafted by Columbus at 154th overall in the 2010 NHL Entry Draft. By signing Prout, the team has locked up their third pending restricted free agent over the last while. Boone Jenner and Ryan Murray signed deals earlier this month, with Prout carried one season into his unrestricted free agency period. That somewhat justifies the considerable jump in salary for the second year of this extension, as it provides a little bit of incentive as the Jackets decide what to do with him. The Blue Jackets should boast a top-tier blueline next season, with the return of Jack Johnson joining Seth Jones and the aforementioned Murray in the group. Prout may not factor in as a fan favourite, but the team does see a role for him as a bruising sort of player who can muck it up when the situation calls for it. Still, it’s hard not to see this deal as a little on the pricey side. It also sets the stage for Jones and William Karlsson, who are the team’s only remaining restricted free agents. Karlsson, for his part, says that he’s deferring any contract talks to the summer. As for Jones, now is the time for the Blue Jackets to really signal their intentions.